Not Found Encode utf-8 without BOM ....... WHY?! If you notice the entry below the one indicated says “UTF-8 BOM”…thus the logical thing is that the indicated entry is without BOM. We don’t say “chocolate chip cookies without lobster” because that would be silly, but if some creative baker combined dessert and seafood we would fully expect the recipe to be entitled “choc. chip cookies with lobster”. 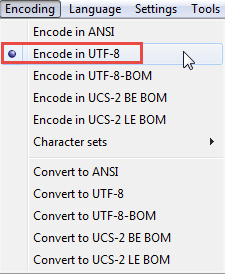 I mean word “Encode in UTF-8 without BOM” , it’s not found in this version … Generally thanks for you >>> scott Summer .